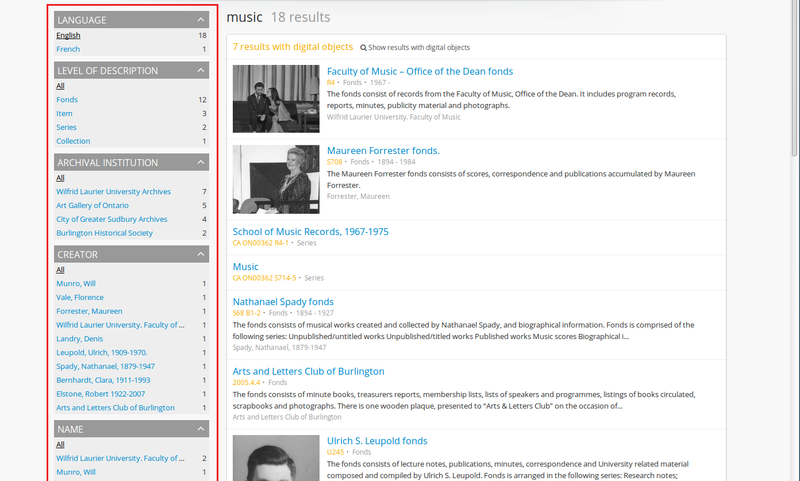 In the default theme, the Dominion theme, AtoM’s view and edit pages are generally displayed in the user interface in either a 2 or 3 column layout - the current record’s display data is presented in the central part of the page, while the side column(s) are generally used to provide additional options and further contextual information to enhance user orientation and navigation. These side columns make up the context menu. The information provided in the context menu varies by the entity type or display. Each is described separately below. The name/logo of the archival institution which holds the resource described. For more information on linking an archival institution to an archival description, see: Link an archival description to an archival institution. The treeview (described in more detail below) if it is set to display in the sidebar mode, and the Quick search box. In the above image, the treeview is set to Full-width display, so only the Quick search box is visible in the left-hand context menu (the full-width treeview appears in the central body of the page). An administrator can set the treeview display mode via Admin > Settings > Global - see: Treeview type. For more information on the Quick search, see: Treeview quick search. If you have configured a custom sidebar menu with links to static pages, these will appear on all archival description view pages below the Quick search and Treeview, in addition to the home page. For more information, see: Add a custom sidebar menu with links to your static pages. A link to add the current record to the Clipboard. For more information on using the Clipboard, see: Clipboard. The reports module. For more information, see: Reports/printing. If the inventory list is configured, and the current description has descendants that match the configuration, a link to the Inventory list will be present, allowing users to explore lower-level records in a table-based list. For more information, see: Using the Inventory list. For settings and configuration, see: Inventory. The “Browse as list” option - for more information, see: Using the “Browse as list” button. The “Browse digital objects” option - for more information, see: Using the “Browse digital objects” button. Import and Export options. For more information on import and export, see: Import/export. Finding aid generation options. For more information on generating and using finding aids in AtoM, see: Generate, upload, download, and print finding aids. Related subjects, linking to descriptions with the same subject as the resource described. Related people and organizations, including the creator of the resource described as well as an people or organizations who are the subject of the resource described. These link to the authority record for the person or organization. Related place access points, linking to descriptions with the same geographical location as the resource described. For more information on adding an access point to an archival description, see: Add an access point “on the fly” from an archival description. Physical storage information related to the archival description. For more information on linking a physical storage location to an archival description, see: Link physical storage. Adminstrators can choose whether or not physical storage information is visible to all users, via the Visible elements module. See Physical storage and Visible elements for further information. The treeview is a contextual and navigation element for archival descriptions or terms (such as place, subject, or genre access points. It serves the dual purpose of showing a record or term’s relationships to other records or terms in a hierarchy, as well as serving as a navigational tool. This section will focus on the Treeview as used for context and navigation in archival description view pages - for more information on the Terms treeview, see: Terms treeview. The treeview for archival descriptions has 2 ways of being displayed - either in the left-hand context menu (referred to as the sidebar treeview), or in a larger version in the main column of the view page of an archival description. The display of the treeview can be controlled by an administrator via a global setting - for more information, see: Treeview type. A comparison of the full-width and sidebar treeview displays. The specific features of each treeview display option will be outlined below. Users can also click on the “Quick search” tab to search for desriptions within the current archival unit. 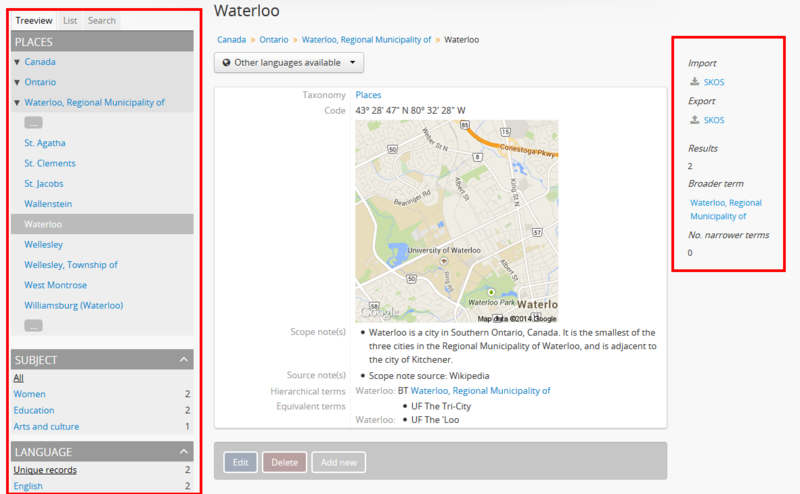 For more information on using the Treeview quick search, see: Treeview quick search. Administrators can decide how they would like descriptions in the sidebar treeview to sort and display throughout their AtoM installation. See Sort treeview (information object). For the full-width treeview, the sort is automatically set to Manual. Sidebar treeview showing the hierarchy of child-levels in a fonds. 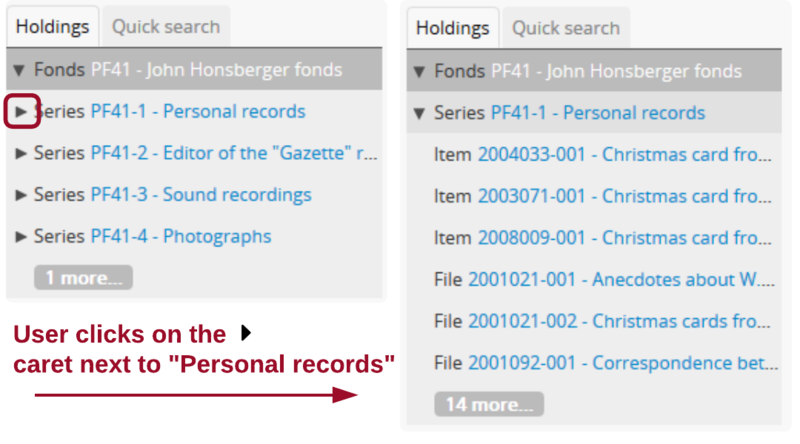 In the figure to the right, the record for an item is highlighted, showing the placement of the file in a hierarchy, e.g. what series and fonds does it belong to. 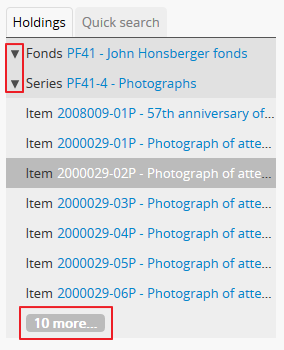 In this example, the user is viewing Item 2000029-02P in a Series called “Photographs,” in a fonds titled the “John Honsberger fonds.” The treeview allows the user to see the current record’s position in the collection hierarchy, and by clicking on the blue hyperlinked titles of other records, the user can navigate easily from one record to another contained in the same fonds or collection. For performance reasons, AtoM may also not load all available descriptions in the current position of the hierarchy - for example, if you are browsing in a series with 20 descriptions, only the first 6-7 may display. In this case, AtoM will include an approximate count of remaining descriptions - clicking on this will load the next batch of available descriptions in the treeview. In the image on the right, there are approximately 10 more item-level descriptions in the “Photographs” series. After the first 2 times, a scrollbar will appear and the treeview will continue to load 4 more descriptions as the user scrolls lower in the treeview pane. When first arriving on the view page for a top-level description (e.g. a fonds or collection, etc), lower-level records with children will appear with a “caret” beside them to indicate that they contain children. 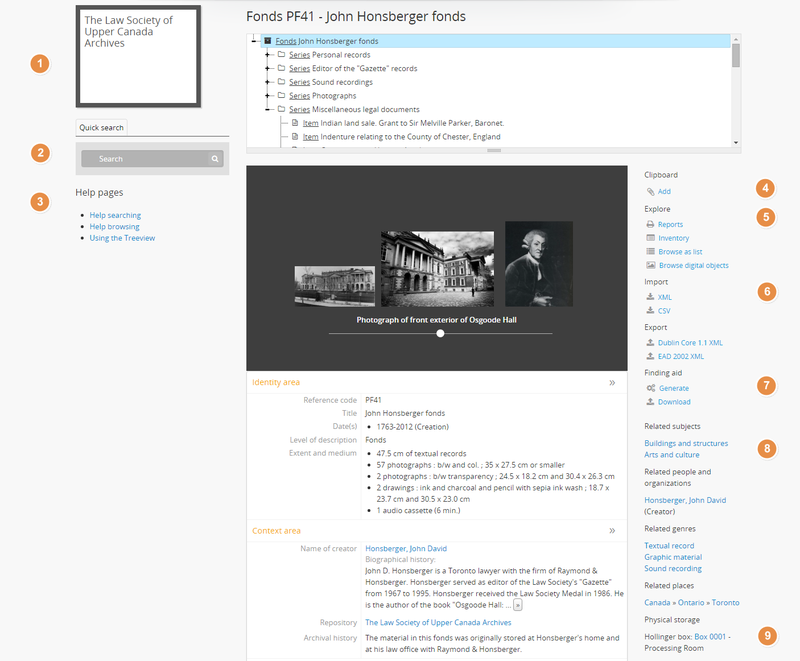 In the treeview on the left in the image below, for example, the user is currently viewing the top-level fonds record for the John Honsberger fonds - the series below, each of which have children, are displayed. Clicking on a series title will reload the page and display that series. However, a user can also click directly on the caret to expand that series without leaving the current view page. The treeview will reload without reloading the whole page, and sibling series will be hidden, as the lower-level item records are displayed for browsing. You could click the caret again to close the current series, and return to viewing all series below the fonds-level record. Sidebar treeview states compared - browsing the series in a fonds (left), then browsing the items in a series (right). Click on a different description title to see that description. The main archival description view page will reload to display the selected record, which will now be highlighted in the treeview. Click on the approximate count button to expand more descriptions not currently in view. Click on the “caret” beside a description with children (e.g. the series description in this example) to expand or collapse all the children titles. 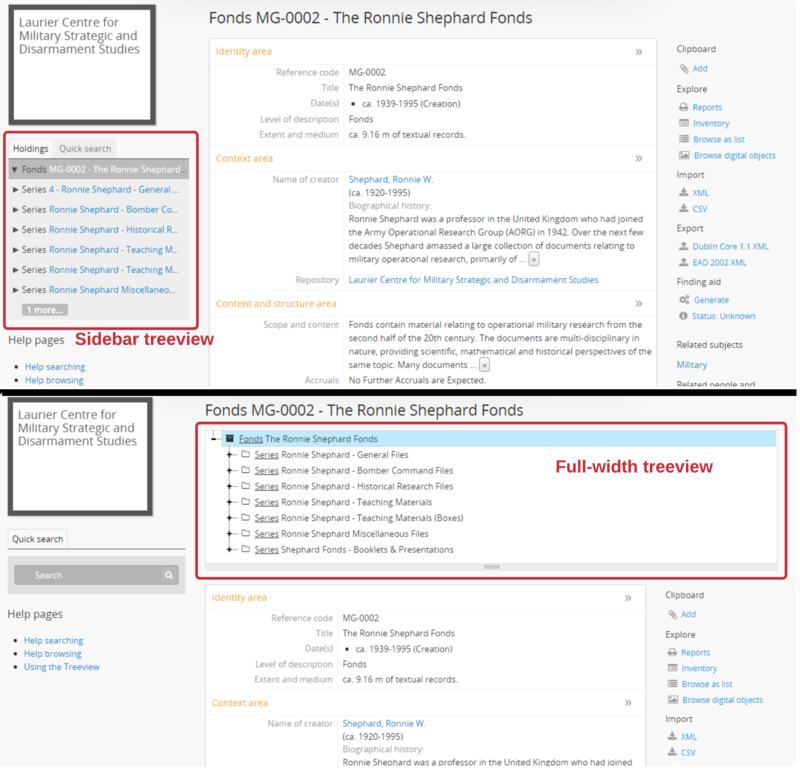 Click on the title of the fonds to return to the fonds-level description, which will also reload the view page to display the selected fonds-level description. An administrator can also change the default sort order of the sidebar treeview via Admin > Settings. 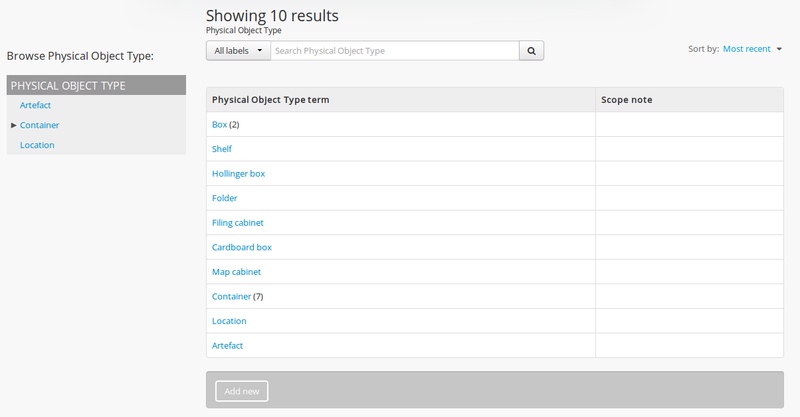 For more information, see: Sort treeview (information object). The full-width treeview also supports keyboard navigation - use the up and down keys to navigate, and the left/right keys to expand or collapse descriptions with children. Basic indentation is used to better visually indicate the hierarchical relationships in the full-width treeview. When a description contains children, a + plus sign appears to the left of its title - click this (or use the right arrow key when the record is selected) to expand the children. The - minus sign can then be clicked (or the left arrow key used) to collapse the parent record again. To help differentiate the levels at a glance, 3 different icons have been used in the full-width treeview. New levels added to the Levels of description taxonomy will use the folder icon by default. As different descriptions are selected in the full-width treeview, the description view page will automatically update to display that record. When navigating with a keyboard, the view page will not update until the user presses the “enter” key to select the description for viewing. Click on a different description title to see that description. The main archival description view page will reload to display the selected record, which will now be highlighted in the treeview. When using the keyboard to navigate, pressing enter will load the selected record in the view page. Use the scroll bar or the up/down arrow keys to navigate up and down the displayed records. Click on the + “plus” sign beside a description with children to expand or collapse all the children titles. If navigating with the keyboard, the right arrow can be used. Click on the - “minus” sign to collapse the child records again, or use the left arrow key. Archival descriptions which the person or organization is the subject of. Archival descriptions which the person or organization is the creator of. Subject and Place terms can be used in AtoM as access points, and then browsed to explore the archival descriptions to which they are linked. For more information, see: Browse subjects and places. 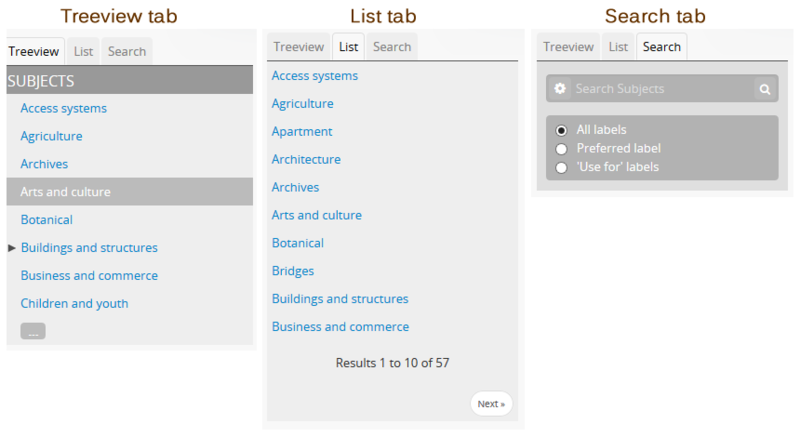 A terms treeview on the left side of the page, with a list view and a term search included in separate tabs. The terms treeview is discussed in greater detail below: Terms treeview. Below the treeview, addtional facet filters that can be applied to the browse results are listed. For more information on using facet filters in AtoM, see: Facet filters. If the current term is part of a hierarchy, a link to the parent record is included under the heading Broader term. If the current term has children in the taxonomy, a count of child terms nested under the current selection is listed under the heading No. narrower terms. The treeview is a contextual and navigation element located in the context menu for archival descriptions, places, and subjects. It serves the dual purpose of showing a record or term’s relationships to other records or terms in a hierarchy, as well as serving as a navigational tool. The terms treeview, used on the browse page for a specific subject or place term, includes three tabs - the default treeview tab, which displays the record in the context of its hierarchical organization; the list tab, which displays terms of all levels ordered alphabetically, and the search tab. Each is described in greater detail below. The treeview tab is the default view for the terms treeview. It shows the terms belonging to the current taxonomy (e.g. subjects or places) in hierarchical context, and allows to the user to browse these hierarchies by clicking on different nodes or titles in the treeview. Click on a different term title to see that term’s description, and any archival descriptions that have been linked to it as an access point. When a new term is clicked, the main term browse view page will reload to display the selected term, which will now be highlighted in the treeview. When a term has children (e.g. narrower terms that are nested beneath it in the taxonomy), a “caret” icon appears next to the term in the treeview. Click on the “caret” beside a term with children to expand or collapse all the children titles. The treeview will only load a certain amount of records at a time. In large taxonomy with many terms, ellipses ( … ) may sometimes appear, indicating that there are more records available. Click on the ellipses to expand more term descriptions not currently in view. See also the instructions on using the archival description treeview, above for further details - the main actions are the same in both treeviews. This main view of the treeview is also used when browsing terms in a taxonomy. See below for more information: Results pages. The list tab allows users to browse all terms in the current taxonomy (e.g. subjects, or places), regardless of where they are positioned hierarchically. In a taxonomy where many terms are nested as narrower terms, it can be difficult to get a sense of all the terms available in the treeview tab or the main taxonomy browse pages. A total count of terms is included at bottom of the page. If there are more than 10 terms, “Next” and “Previous” buttons are included to navigate between pages. The search tab in the terms treeview operates the same as the dedicated search for terms included in the terms browse page. Users can click the gear icon to limit the search to the preferred term label (e.g. the authorized form of name), ‘Use for’ labels (e.g. non-preferred, alternate forms of name), or both. The default setting is to search both. For more information on using the dedicated term search box, see: Search for Terms. The name/logo of the institution. A list of the first 10 alphabetically listed holdings at the fonds or collection level of description of the institution, with a link to the complete holdings. The primary contact information for the institution, including buttons that link to the institution’s website and email. 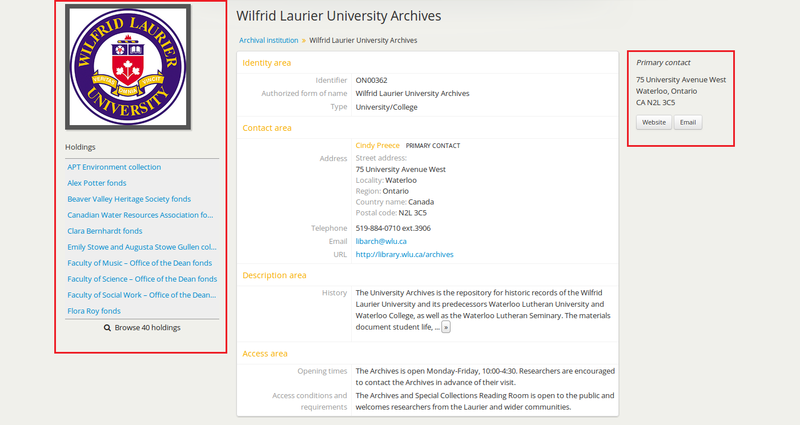 The contact information is drawn from the information added to the “Contact” area of the archival institution record. When a user searches for information objects, the context menu consists of facet filters which allow the user to narrow down their search results. For more information on working with facet filters in AtoM, see: Facet filters. When a user searches for a term which is organized hierarchically in a taxonomy the context menu will include a treeview of that taxonomy. Place and Subject term browse pages have additional features available in tabs in the treeview provided in the context menu. For more information, see above, Terms treeview.